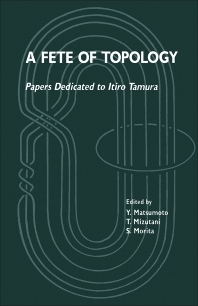 A Fête of Topology: Papers Dedicated to Itiro Tamura focuses on the progress in the processes, methodologies, and approaches involved in topology, including foliations, cohomology, and surface bundles. The publication first takes a look at leaf closures in Riemannian foliations and differentiable singular cohomology for foliations. Discussions focus on differentiable singular chains restricted to leaves, differentiable singular cohomology for foliations, covering of pseudogroups and fundamental group, normal type of an orbit closure, and construction of a global model. The text then takes a look at measure of exceptional minimal sets of codimension one foliations, examples of exceptional minimal sets, foliations transverse to non-singular Morse-Smale flows, and Chern character for discrete groups. The manuscript ponders on characteristic classes of surface bundles and bounded cohomology, Hill's equation, isomonodromy deformation and characteristic classes, and topology of folds, cusps, and Morin singularities. Topics include system of Hill's equations, Lagrange-Grassman manifold, positive curves, Morse theory, bounded cohomology, and characteristic classes of surface bundles. The publication is a vital source of information for researchers interested in topology.